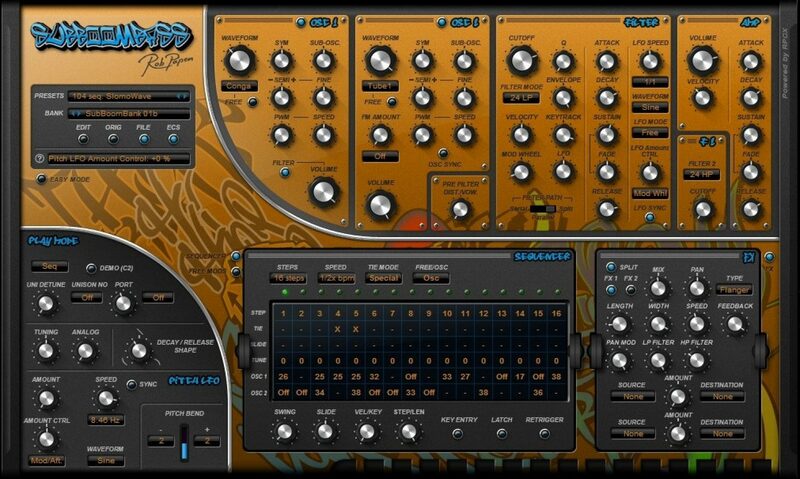 Rob Papen released their SubBoomBass back in 2009, and it was their first non-generic synthesizer, that focused almost exclusively on being a great bass synthesizer. SubBoomBass is included in Rob Papen‘s Explorer-III bundle which was released earlier this year, so we took the time to have a look at the synth. The UI of SubBoomBass is very unique and distinctive. Love it or hate it, you can tell what the synth is just by the graffiti style backdrop. While I’m not the biggest fan of the graffiti background, the layout of the controls is another story. On the left of the plugin there is a small area for users to load and save presets. Next to that, the two oscillators, the filter and and amplifier controls are found, each in their own distinctive section. Below that users can toggle the sequencer and the “free mods” section, which allows users to assign an envelope and LFO to a parameter of their choosing. To the right of that, the FX section is found, and on the left of the plugin users will find “play host” controls. Overall the interface of the plugin is very user friendly, and is extremely easy to navigate. The first section in the synth is the oscillators, and these really are a strong part of the synth. The oscillators feature 16 different waveforms to choose from, including the standard sine wave, saw, square and triangle, as well as a number of combination waveforms. The oscillator sections allow users control over tuning, as well as sync ring, modulation, keyboard tracking, and so on. There is also a sub-oscillator knob per oscillator. The synth also includes a number of sample-based oscillators, many made from tuned-down instruments. Most of these are percussion instruments such as kick drums and toms, but there are also bass guitars. These can give your sound some extra grit by using modulation with them. Next in the chain after the oscillators is the filter and the amp sections. These allow you to drive the signal to give it some extra grit, or even to completely change the sound of the synth. The first filter allows for high-pass, band-pass and low-pass notches, and users can select from 6dB, 12dB, 18dB and 24dB increments. The filter also has comb and vowel filters, as well as a dedicated LFO. The second filter is a little less intense, and has high-pass and low-pass options in 6dB, 12dB and 24dB. Apart from a cutoff knob, that’s all this filter offers. After the filters, the amplifier can be found. The amp on this synth is fairly simple, and has an ADSR section with a fade that is also found in the filter and modulation sections. The fade allows users specify that they want the sound to either rise to 100% or fall to 0% over a particular time period, instead of the signal being held at the sustain level. The sequencer is a nice addition to the plugin, though it is a little unfortunate that it only includes 16 steps and only allows user to have one sequence per patch. While It’s nice that it was included, it seems like it was a bit of an afterthought. Of course this isn’t to say that the sequencer isn’t useful. In fact, for basic sequencing, it can be a real life-saver! SubBoomBass also includes a whopping 23 effects, which can be chosen from on the far right of the plugin. The effects section includes reverbs, delays, modulation, filtering, EQ, compression, and so on. The selection is quite impressive, and it’s easy to tell that Rob Papen has put a lot of effort into it. As far as bass synths go, Rob Papen’s SubBoomBass is about as good as they get. It’s versatile and sounds great. The sequencer is certainly the weakest part of the plugin, but it’s also the only weak part of the plugin. If you’re looking for a great sounding bass synth to add to your repertoire, then SubBoomBass is the synth for you.